The Special Education Program consists of a team of facilitators who develop programs and provide supports to educators working with special needs children in First Nations schools. The team includes speech and language pathologists, occupational therapists, special education facilitators, Deaf and Hard of Hearing facilitators, and literacy coaches. The program continues to provide enhanced services in three main areas: Special Education Services, Training Initiatives, and Clinical Services (school-based). Clinical Services provide much needed support for students with special needs, who require specialized intervention from the clinicians. Special Education Services develops programs and provides support to educators, educational assistants, and resource teachers in First Nations schools that work with special needs students. Facilitators are assigned to specific schools to work in areas such as attention deficit hyperactivity disorder, autism/fetal alcohol spectrum disorder, Non-Violent Crisis Intervention, and remedial programming. 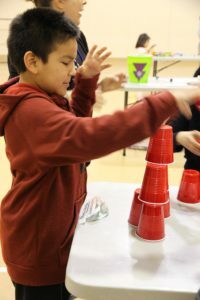 MFNERC’s Training Initiatives provides support through the provision of accredited professional development required to implement innovative programming in First Nations schools. Our participants are mainly First Nations staff employed at either First Nations schools or at MFNERC. Ongoing research and assessment identifies the growing demand to provide services to children with special needs. The Special Education Program continues to adapt and grow to meet these challenges. Last week, we were able to catch up with Jennifer Daniels while she was in the MFNERC office. She was busy setting up a student assessment in the boardroom and making sure the child who was here was comfortable.